One. Two. Three. Four. Five. Six. Seven. 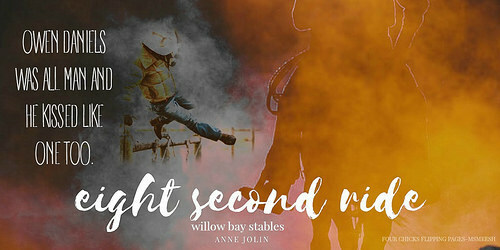 Eight….Eight seconds was all it took for me to fall hard and get addicted to Anne Jolin. Saddle up and hold on tight as Anne Jolin has me ready to rope in Owen Daniels as one of my favorite cowboys. 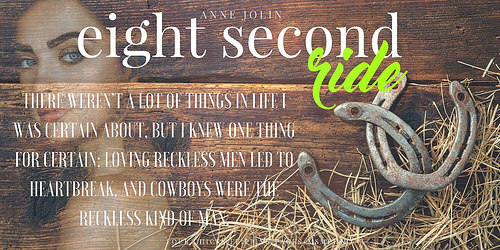 Okay, I have a confession to make Eight Second Ride is the first book that I have read from Anne Jolin. I know, I know how come it took me so long to read her books but rest assured after reading this book, I am hooked and can’t wait to read her other books. With that confession out of the way, let’s talk about Owen Daniels!!! Who is Owen Daniels? Well besides the fact that he is my new cowboy book husband. Yes, Anne Jolin I am claiming him. Owen Daniels is a rodeo bronco rider and so when he heads back home to get his horse, Remington’s Lady from the local vet, he is greeted by the new veterinarian, Rayne Brookes. After meeting Rayne, Owen immediately asked out Rayne out on a date but she turns him down. After two tries, she turns him down again but that doesn’t stop Owen from worming his way into Rayne’s heart. When he heard that Rayne needed a new roof, Owen immediately went to her house to fix it up and was greeted by Rayne and her daughter. Soon Rayne’s guard begins to crumble and she agrees to go on a date with Owen. As far as first dates goes, Owen had won me over when he included Rayne’s daughter, Ryley on their outing. And soon it didn’t take long for Rayne and Owen to fall hard. Owen makes it known to Rayne that he will take care of her and her daughter. Trust me, when I tell you that you will be totally smitten with Owen. As Owen and Rayne’s relationship progresses, readers will soon discover as to why Rayne didn’t want to date a cowboy. Will Rayne’s fear and past prevent her from truly moving forward with Owen? Will Owen be able to show Rayne that it only took 8 seconds to fall hard for her? One. Two. Three. Four. Five. Six. Seven. Eight….. Eight seconds is the amount of time a bronco needs to stay on. Eight seconds of pure adrenaline and fear. Eight seconds of victory. For any cowboy, it is the longest eight seconds of your life. But within those eight seconds, life and love can be lost and found. For Owen Daniels, his eight seconds to holding onto is nothing compared to a lifetime of loving Rayne and her daughter Ryley. And so Anne Jolin brings forth a love story that will capture your heart for more than eight seconds. 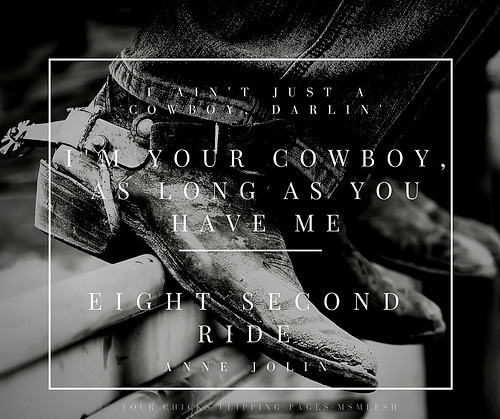 Eight Second Ride was a sweet, heartwarming summer read that will leave a big fat smile on your face. Anne Jolin beautifully reigns in her readers as she weaves a second chance romance that is filled with hope, beauty, love, honesty, and raw vulnerability. I absolutely adore this book and author. Everything about this book was just perfect. I loved the simplicity of the story line. While this book focused on Owen and his love for Rayne, I loved that Anne Jolin incorporated a raw and real backstory as to why Rayne is guarded with her heart. So if you are looking for a story that didn’t take me a minute or an hour to fall in love with, but within eight seconds then I would highly recommend you to fall in love with Owen Daniels and his eight second ride to forever.